The aim of this NERC-funded project was to make direct measurement of the turbulent air-sea fluxes of CO2, sea-spray aerosol, sensible and latent heat and momentum in order to improve the parameterisation of these fluxes in terms of mean meteorological and sea-state variables. 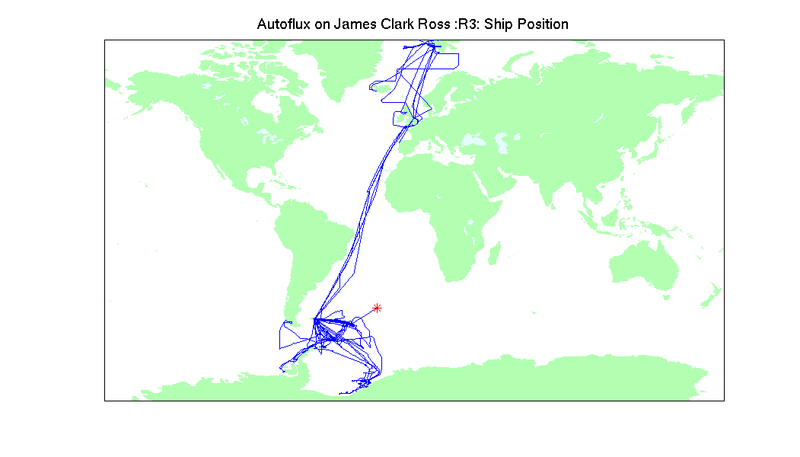 In order to do this we installed a range of instrumentation, including the autonomous air-sea flux system "AutoFlux" and a directional wave radar "WAVEX", on the British Antarctic Survery ship, the RRS James Clark Ross. The WAGES instruments operated continuously for 3 years, from May 2010 to July 2013, and obtained data in a wide range of conditions particularly the poorly-understood high wind speed regime. The figure shows the cruise track during the 3 year measurement campaign (click on it for a larger image). DATA FROM THE SHIP were received via an iridium satellite message once per day. These mean meteorological and wave data can be viewed here. WAGES was a joint project with the University of Leeds. WAGES was preceded by a similar 3-year (2006-2009) continuous flux measurement campaign on the Ocean Weather Ship Polarfront as part of the UK-SOLAS project HiWASE. In addition to the continuous autonomous measurements, we also had 6 manned cruises on the ship - during these cruises we deployed a novel spar buoy to make measurements of wave breaking and whitecaps under a wide range of conditions (mean wind speeds up to 20 m/s and significant wave heights of 8 m). We are grateful to the ship's staff and members of BAS AME and IT departments for their help throughout the project.